Def Leppard are really ending the year with a bang. Not only are they touring the UK playing the Hysteria album in full, but they’re also releasing a “best of” compilation album with tracks spanning most of their career. That’s not all though – they’re also releasing “Hysteria – The singles”, which is a 10 disc vinyl box set set featuring all of the 7” singles from the Hysteria album (which made up most of the album, such was it’s success). 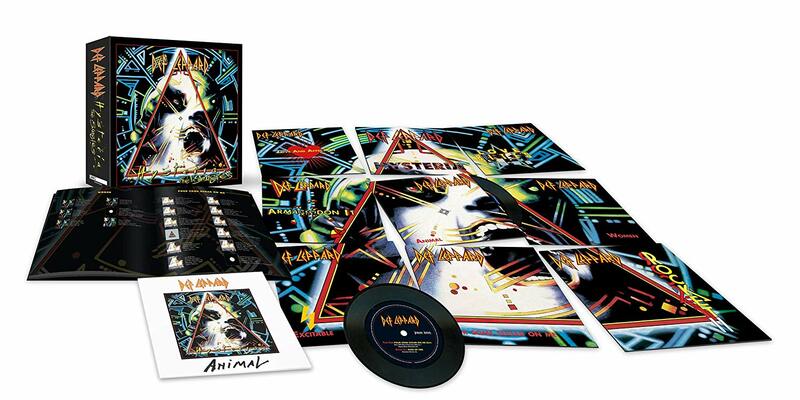 Housed in a box with a lift-off lid, Hysteria: The Singles features new cover art made up of all 10 of the single’s sleeves, including the special Spanish “Animal” single, plus a booklet with a full band discography and an introduction written by Joe Elliott. It’s certainly a nice collection but it’s definitely not cheap – at over £80 it really limits the market to obsessive fans who will buy anything the band put out, and serious vinyl junkies. If you love Def Leppard and the Hysteria album in particular then in my opinion a better use of the money would be to buy the 30th anniversary box set of the album which is a similar price but contains 5 CDs, 2 DVDs, and books. It also includes the singles, B sides, and things like alternate versions, so is a really comprehensive collection.